GM's message Sunday in the Park is a new day in LA! I hope this newsletter finds you well. It has been a marathon of 12-14 hour days this week to try and get everything completed by the end of the fiscal year. Again, I want to appreciate our staff for stepping up to make sure all the funding documents and Board of Neighborhood Commissioners reports were completed on time. Controller Wendy Greuel and her staff really deserve some special recognition as well for going above and beyond to support us and Neighborhood Councils not only these past few days and weeks, but the last year, too. 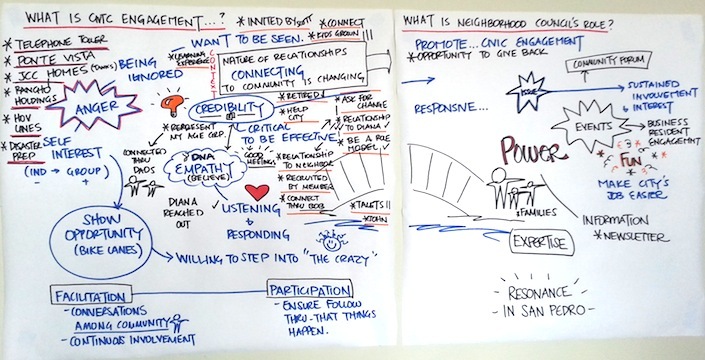 Speaking with the NorthWest San Pedro Neighborhood Council at their great retreat last Saturday where their moderator made this amazing flow "bridge" of civic engagement. I hope your Neighborhood Councils make time for retreats to talk about your goals for the year, which would be great for your strategic plans due with your budget package on July 12th. Watching the three Plan Review Committees meet and struggle over Neighborhood Council issues later the same Saturday. It is obvious that every one of them really cares about the future of the system to invest this many hours. They are planning one more meeting to wrap up their recommendations. A big thank you to them! Launching the workshops for the new Funding Program finally on Tuesday! Just this week, over 200 Board members have either watched it online or come in person (108 in the Valley, which felt like the temperature outside, too!). A huge thank you to our Funding Program Director, Armando Ruiz, who has led on this project. Check out the links below to get your training completed. A marathon four hour special Board of Neighborhood Commissioners meeting to approve all of the Board structure and boundary adjustment applications last night and send out proposed Plan Review Committee motions for Neighborhood Council input (more below). 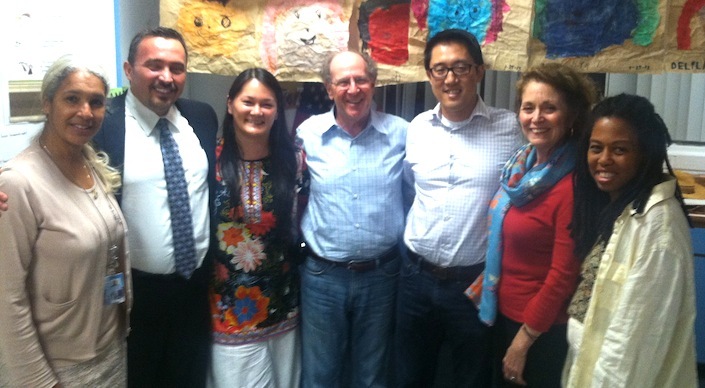 This was President Paul Park's last meeting because he will be moving outside of the City. We really appreciated his leadership this past year, and I'm hoping I can talk him into running for a Neighborhood Council since he still works in LA. We look forward to July 1st when our new Mayor and City electeds start their first day. It's especially exciting to see Controller-elect Ron Galperin and Council District 13 Councilmember-elect Mitch O'Farrell, who were part of our Neighborhood Council family, step into their new leadership roles. 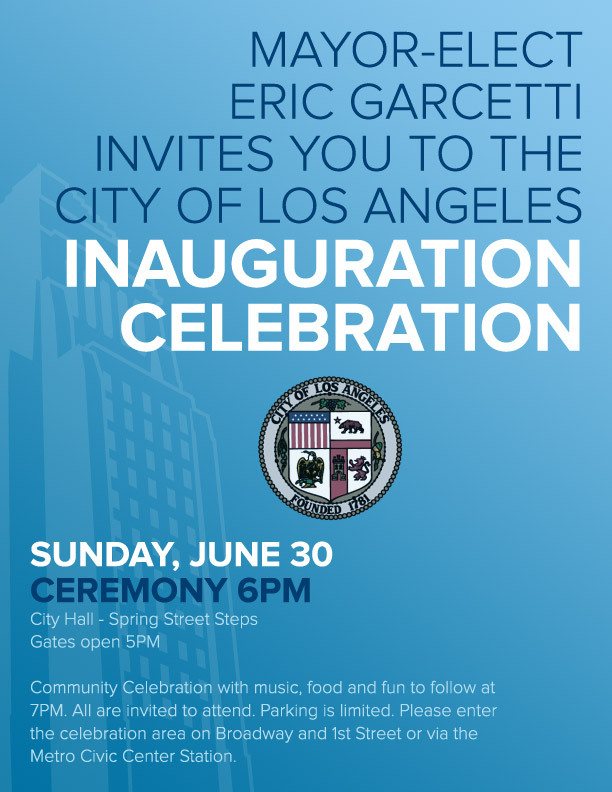 EmpowerLA will have a table at Mayor-elect Eric Garcetti's inauguration on Sunday so please come and join us at 5 p.m. on Grand Park to celebrate and talk Neighborhood Councils. I'll be staying cool in the Harbor area tomorrow for our EmpowerLA Advocacy and Funding Workshops so hope you stay cool, too, this weekend! Do they already know each other? Will they want to participate in a robust discussion that results more emails? Do they already have each other's contact information?.. (1) What information and artwork will go on the banners? They can all be the same or there can be a variety of banners that are placed along the boulevard. They can be general information (Lincoln Heights NC) or specific to an event (Atwater Village NC).